From the lips of fellow beauty whore, Di Gaeta…. “The season has moved in to dull, dry winter and so has my skin. I have incredibly parched skin, I can actually slather Eucerin on my face and not break out! 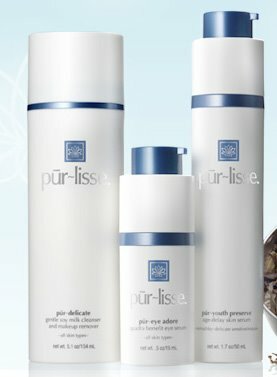 So, as the designated Dry Skin product tester, I was excited when Sarah gave me a line called PUR-LISSE. The line obviously encompasses a wide range of products for all skin types but I cannot say enough about the PUR-MOIST and The PUR-YOUTH PRESERVE. The PUR-YOUTH is a thick, silky serum that glides on the skin like velvet and really coats it. It’s heavy in the best way, like a cashmere full-length wrap for your face. It has incredibly pure ingredients and gets its effectiveness from blue lotus, lupine peptides, sea silk, soy proteins and white tea. It is loaded with Vitamin E and Rice Bran Oil. I kid you not, I think it literally erased ANY tiny lines on my face. The PUR-MOIST is the hydra balance moisturizer and it is the perfect companion to the PUR-YOUTH. Think of it as your furry earmuffs and scarf. It has the same main ingredients as the serum and together they will absolutely solve ANY dry skin woe. I can’t stress enough how comfortable these product are. To view the entire line, click here.